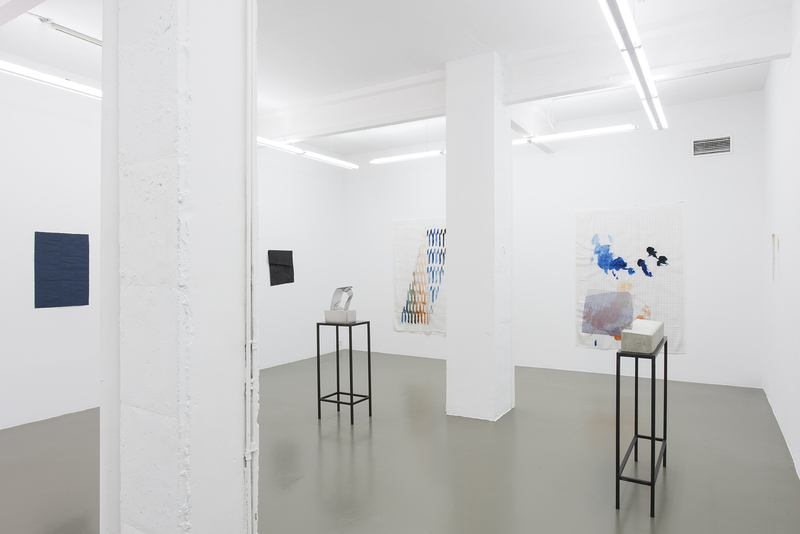 Maisterravalbuena is pleased to present the group exhibition Elapse / End including the works of Andy Boot, N. Dash, Joana Escoval, Fay Nicolson and Daniel Steegmann Mangrané. Elapse / End are two situations or statuses attached to the structure of the acts of doing, selecting and choosing. In the case of the artists present in the exhibition, these two concepts appear clearly by the inclusion of different expressions of time within the process and the use of the materials as containers of this phenomenon, concluding the work and slowing down the movement generated in the process once the work has been located in the context of the exhibition facilities. The works present in Elapse / End make us reflect on the idea of material (both its qualities and its cultural uses) as a transmitter of knowledge as well as a document that reveals -through its selection, relation, manipulation and manufacture- a process in which the different narratives have been overlapped. 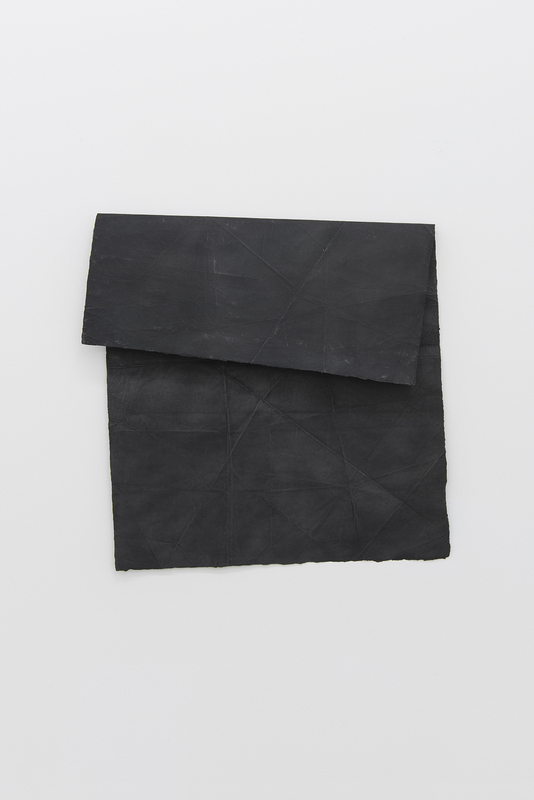 The relations and physical and symbolic tensions between the different materials, such as silk, metal, stone, graphite, insects, wood sticks or bronze, work here as destabilizing elements that, when displayed, raise questions about the ideas of representation and repetition, and make us think about the use of replica or copy. In order to stress the idea of the material as a container of different times and the idea of the exhibiting use of the work as an abrupt way to conclude a process, N. Dash presents three works of the series “Commuter”. Commuter, in English, refers to a person who uses the public transport to go from home to work. Dash created this series during these commuting trips, where almost mechanical activities normally take place, such as reading or chatting with the cell phone. Dash always carries a paper with her in these places, which she automatically folds and unfolds until almost totally fray its fiber. This way, the physical qualities of the material decide when to conclude the piece. 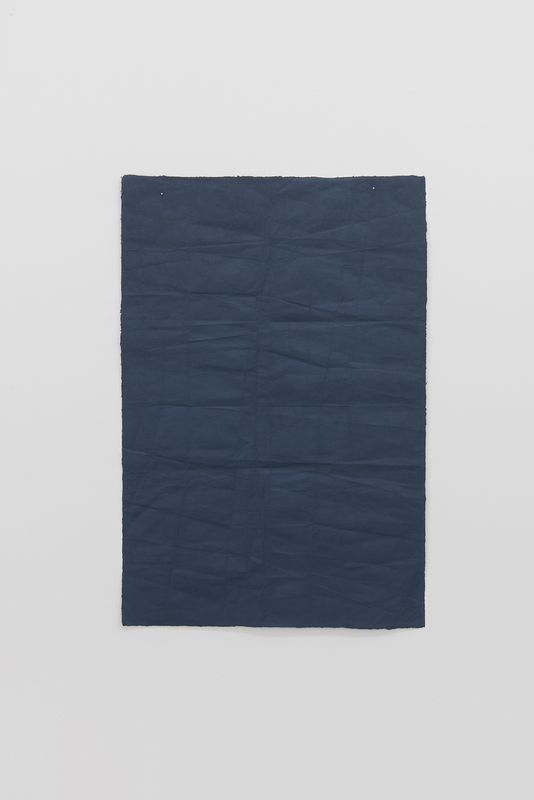 When the paper is just about to be torn, Dash applies on its surface a layer of color wax or graphite, as a way to preserve or seal that action. 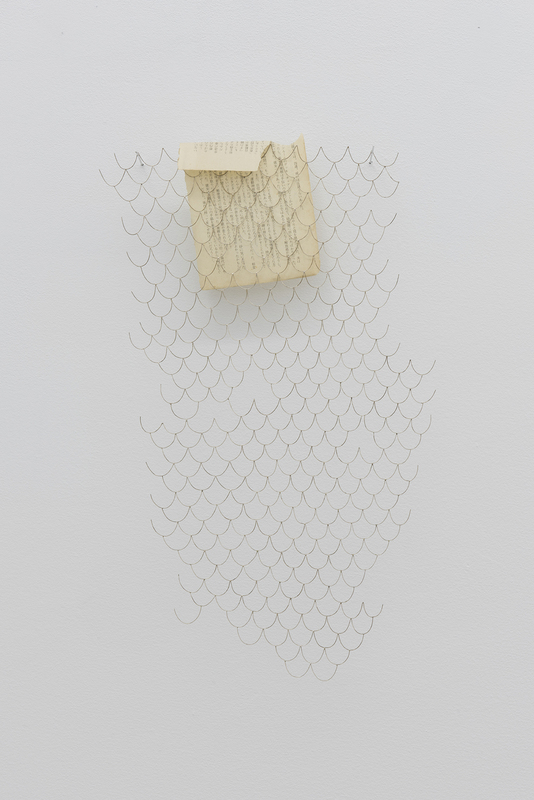 When including the work process within a public space of her daily routine, Dash drifts away from the preconceived idea of creation, turning it into a vital need. 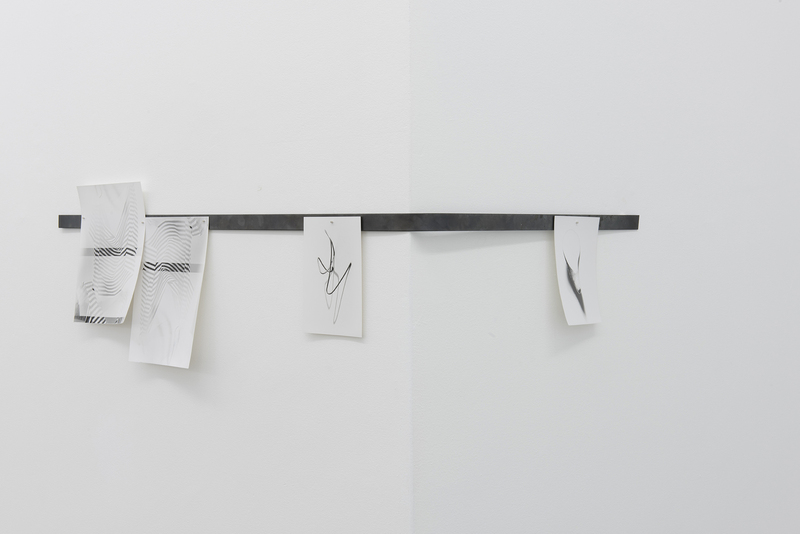 This way of drawing through touching, and the physical transformation of the paper, makes Dash raise questions about the built representation and claim the very act of doing itself. In the Commuter series, time has almost a physical quality, and there is no room for corrections. All the time invested in the process is recorded on the base, acting as an image. 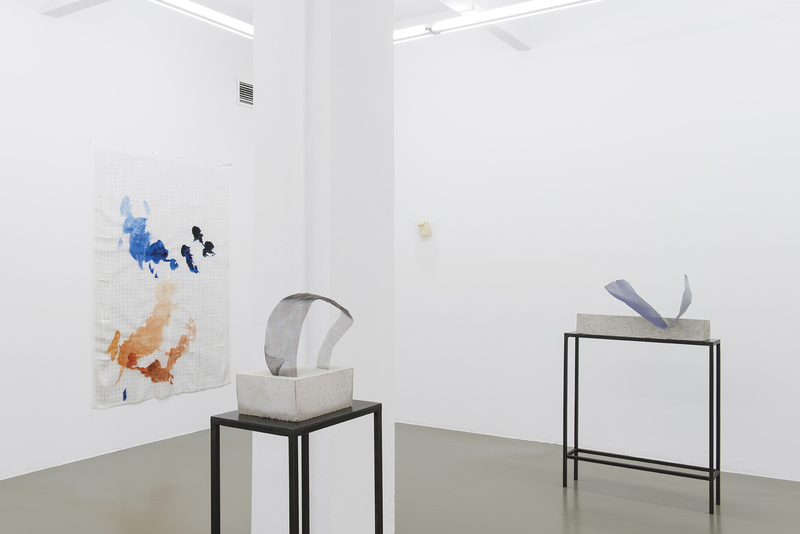 Joana Escoval presents sculptures mixing cold materials such as brass, silver or bronze, and organic ones such as stone, paper or algae. Some of the materials are related to culture, thus handled through controlled processes, and some of them come from a location in Nature by which their composition, color and shape have been originated after thousands of years, where chance plays an important role. This symbiosis of opposites can be seen in the sculpture “Useless Education”. 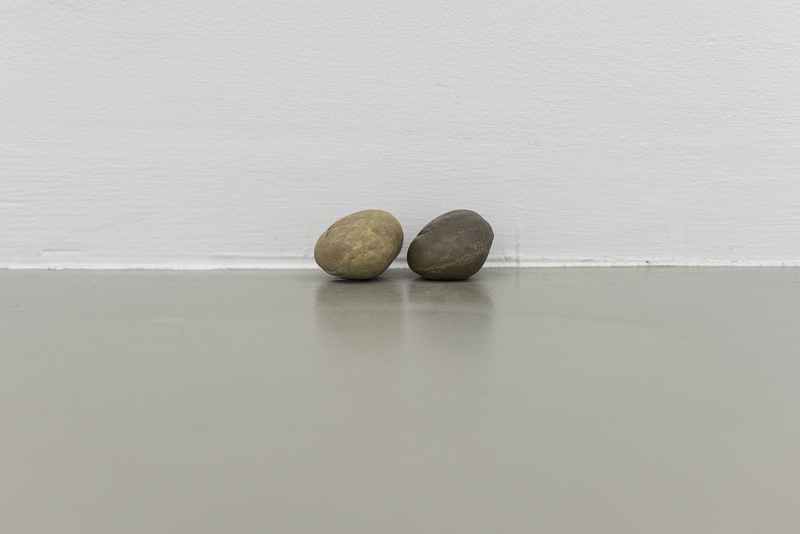 We find here two stones with the exact same shape, molded by natural processes though different geological cycles, and another one made of bronze copying the shape of the previous one. 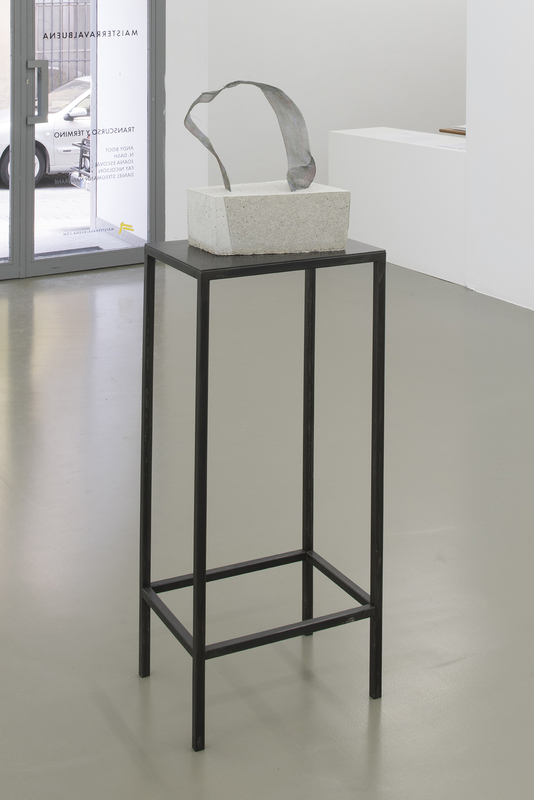 As we can also see in the pieces of Andy Boot and Fay Nicolson, this work recalls the idea of copy as an allegory of the represented object, giving it a meaning which is different from the original one. “Useless Education” might symbolize the failed attempt of the termination of a process, an attempt to control and understand a phenomenon of endless moving. 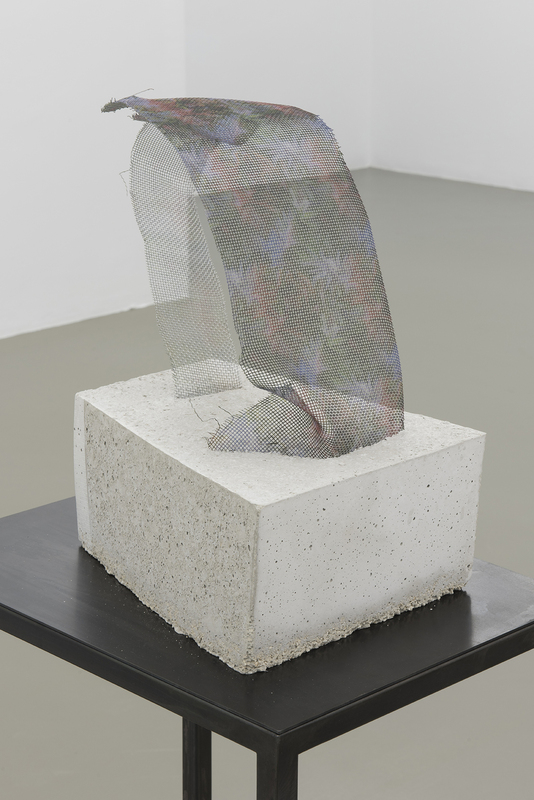 Andy Boot presents three sculptures of his last series of works where he digs into the idea of copy, pattern and seriality, and the uses of language and information consumption. In these works, Boot prints different digital patterns on metal grilles, which are adhered to rectangular concrete bases with different organic shapes. The diverse patterns printed on the metal grilles are inspired by the desktop backgrounds of Geocities, the failed platform by which websites could be customized. In some occasions, these desktop backgrounds tried to be abstract comments on the activities each website was designed for. The titles of Boot’s sculptures refer to that fact, as an attempt to provide the patterns with figurative qualities through language. Fay Nicolson also resorts to the idea of copy and repetition as a part of the creative process, reflecting on learning and education systems through the materials and its uses. On this occasion, Nicolson presents two series of works in which she combines mechanical production systems with handcrafting. 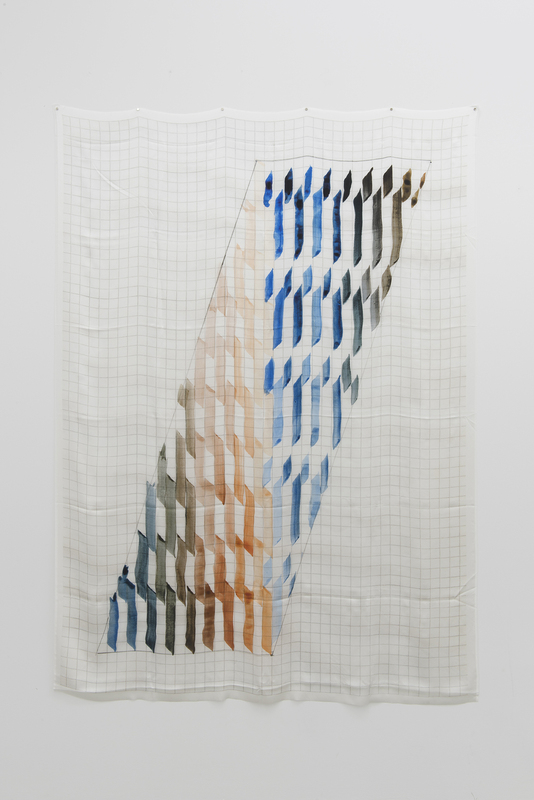 Nicolson paints with watercolor on small-format squared paper, following a system of repetition through a pattern of shape and color. Once the watercolor painting is finished, she scans it and prints the image on large-format on a silk cloth. The printing flattens and cools the structure of the watercolor, contrasting with the sensuality of the base. 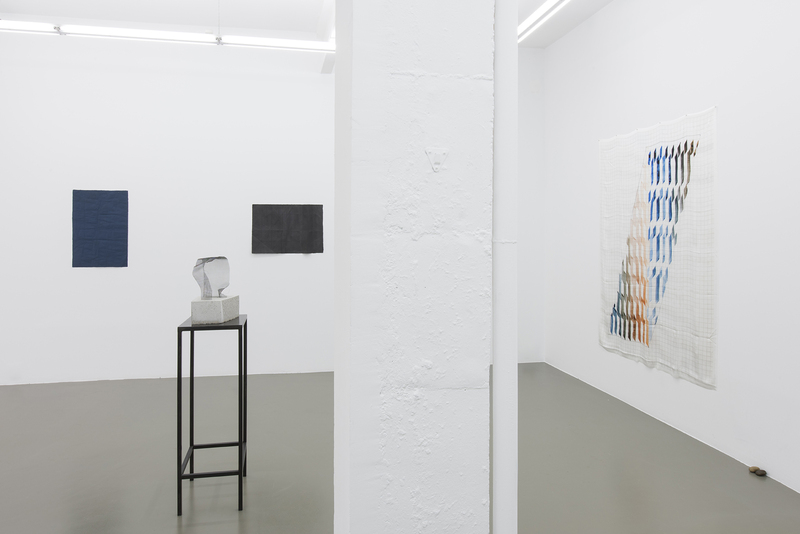 From the two works on cloth present in the exhibition, we can see that one of them has a system of seriality and color, following the squares weave, but the other one shows some gestural forms of turbulent appearance, not following the order of the squares and triggering tension between the image and the weave. Actually, these stains appeared while Nicolson was painting another piece. Before applying a color stroke, the artist presses the paintbrush against a paper to get rid of the extra paint, thus composing this piece through these actions. Accordingly, Nicolson subverts the symbolic idea of the squares as a structure putting a process in order and serving as a frame for a rigid system. Daniel Steegmann Mangrané presents Morfogenisis – cripsis, a mural work made with color pencils, a stick insect and the stick of a tree. Cripsis is a phenomenon by which a living organism adapts to protect from other animals. The stick insect, for instance, shapes into a stick to be camouflaged before its predators. In this piece, Steegmann reflects on the separation of modernism from what is phenomenological, putting all that is geometrical and all that is organic at the same level, as well as movement and statics. 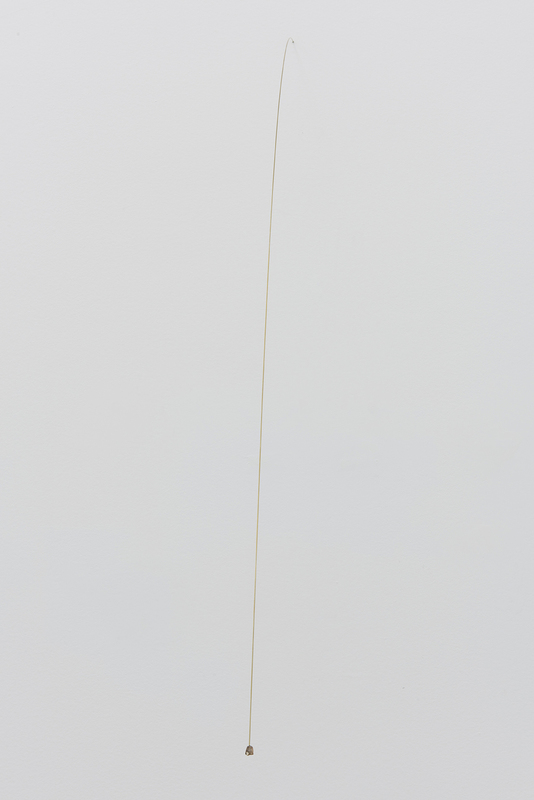 The lines drawn on the wall imitate the organic shapes of the stick of a tree and are difficult to tell apart from that of the stick insect, thus raising questions on the hierarchies of representation.